Stepping into the ocean, you accept coming out you will be covered in salt, and when it dries you will be a lighter shade of white, all sticky and preserved. 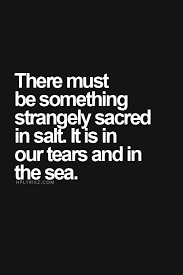 The flavours of the sea are carried around with you, even when you wash away the briny dust from your flesh, the earthy spice becomes a part of who you are. Memories are like that too, some never seem to want to leave your Soul, you have cried a million tears to wash away the flavour of the pain, but the wound you know, is still there. Time they say heals everything, but it feels like a million life experiences have passed you by, and the heartbreak and sadness remains intact. Dreams come to haunt you, a constant reminder of what lies beneath. Like fathoming the ocean, you dive deeper to understand the darkness beyond your Soul, the depths of your memory seems unreachable. Perhaps it’s the way it has to be, something left behind to face when we come again, another life, another time, another century to work it out. Maybe we are not meant to do it all, conceivably some soul work must be neglected, a conscious decision made to be born again. So you see beautiful Soul, if there is something that still causes you sorrow and grief, with all of your efforts to ease the sadness it just won’t go away, perhaps begin to accept that place within you, knowing it will always feel a little tender and sore, for a reason that is yet unknown to you. Trust your Spiritual path and know without a doubt that you are doing the best that you can, and let that be enough.